Bold Street has transformed itself into a lively street with an eclectic collection of restaurants, cafes and shops like the unusual Bold Street Sweets @BoldstreetSweet selling retro sweets. Our first meal in Liverpool was in Bold Street at Kasbah Café Bazaar www.kasbahcafebazaar.co.uk . The décor and furniture at Kasbah is like stepping into a corner of Morocco. Open from 10am to 10pm, traditional Morrocan items are on sale such as a fez (£10) or organic dry figs with oregano (£6.99). First up, we shared hummus and Makdous (both £3.95) – tangy aubergines stuffed with walnuts, garlic and olive. When I said I was gluten free and was unable to eat the pitta bread, they brought some crudités. After being assured there was no wheat in the tagines, I ordered Tagine Merzouga (£9.95), a vast sized lamb tagine with caramelised figs, walnuts and cinnamon, sprinkled with sesame seeds. Unfortunately there was dairy in the tagines, so Ray had lamb chops marinated with spices (£9.95). No alcohol is served here, but there’s a wide selection of juices at £1.70 a glass. Staying at the comfortable and stylish Hope Street Hotel (www.hopestreethotel) which is conveniently located in Hope Street, our favourite venue for breakfast is Leaf on Bold Street www.thisisleaf.co.uk an independent teashop and bar, also named by The Times as one of the best venues for brunch. Ray’s favourite was a toasted bacon sandwich with beans, although on the first morning I forgot to tell them no butter on the bread, so it had to go back! I have to be careful with porridge as sometimes it can make me poorly, but here I was ok although I asked it to be made with water (not milk) and to have soya milk with it. Very good value at £2.25 for an enormous plateful to keep you going throughout the day. If you can’t eat porridge oats, the full English breakfast is good value at £6.50. The good news is that they serve soya milk! It’s always tricky when you go to a party if you have a food allergy. I’m normally upfront and tell people, but sometimes it isn’t possible. But we needn’t have worried because at our friend’s birthday party, held at the Liverpool Marina Bar and Grill, she had made arrangements for everyone with food allergies – so the chicken casserole was gluten free and the chef organised a special dish for Ray – chicken with vegetables. Great stuff. On the Sunday we visited the new Museum of Liverpool, which tells the story of Liverpoolwww.liverpoolmuseums.org.uk/mol to the present day. Highlights include the Overhead Liverpool railway where you can get on board the only surviving carriage from the historic railway, learn about the route it took and its importance to Liverpool’s docks. That evening we met friends at Matou www.matou.co.uk, a pan Asian restaurant. 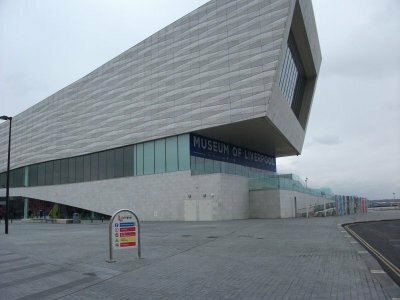 It is at the Pier Head, opposite the Museum of Liverpool, overlooking the River Mersey. The restaurant is on the second floor, giving a wonderful view. I was concerned about the sign in the lift that asked people not to bounce up and down it will get stuck in between floors and it takes an hour to call the engineer. I said to Ray I wouldn’t be taking the lift! 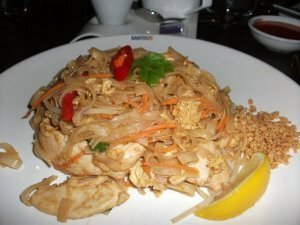 The restaurant has an extensive menu, but we decided to play it safe and had Malaysian chicken satay (£7.90) to start with and Chicken Pad Thai (£10.90) as the main course. As we were waiting for our tea, a loud fire alarm was sounded, but to our consternation no-one rushed to leave the building. We were told someone downstairs must have set it off by mistake. After a couple of minutes, it was turned off. We finished our tea and paid. As we left, down the stairs of course, a group of women were stuck in the lift, banging on the doors and shouting. We went back to tell the restaurant staff, but they could already hear it. I hope they weren’t stuck in there for long.